12 green king prawns, peeled and deveined. Slice the cheeks of the peaches about half a centimetre thick (you should get four slices off each peach). Brush with 1tbsp of the oil and grill or pan-fry until tender. Set aside. Grill or pan-fry the prawns in the same pan until they just change colour. Meanwhile, heat the honey and vinegar in a small saucepan until the honey melts and the mixture is combined. Remove from heat. Cut the French stick into 2cm thick slices. Brush with remaining oil and grill until golden on both sides. 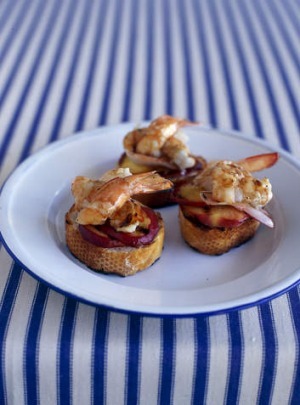 Place 2 peach slices on each piece of bread, top with a prawn and drizzle over the honey and balsamic. Serve immediately.